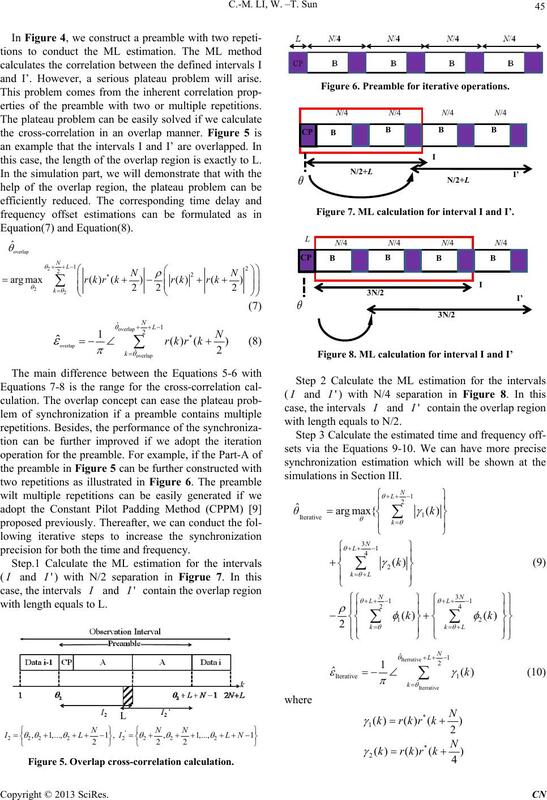 maximum likelihood method for synchronization. We also adopt the overlap concept to reduce the plateau problem. 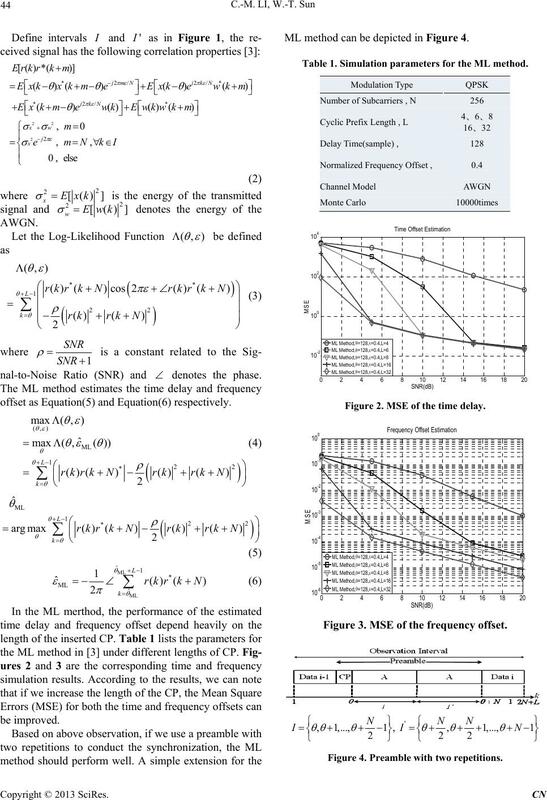 especially for the OFDM system. reduce the plateau problem [2,4]. are given in Section IV. Guard Interval (GI) of the OFDM signal to avoid the ISI. and L is the length of the CP. Figure 1. ML synchronization method. nal-to-Noise Ratio (SNR) and denotes the phase. offset as Equation(5) and Equation(6) respectively. ML method can be depicted in Fi gur e 4. Table 1. Simulation parameters for the ML method. Figure 2. MSE of the time delay. Figure 3. MSE of the frequency offset. Figure 4. Preamble with two repetitions. and I’. However, a serious plateau problem will arise. erties of the preamble with two or multiple repetitions. this case, the length of the overlap region is exactly to L.
precision for both the time and frequency. with length equals to L.
Figure 5. Overlap cross-correlation calculation. Figure 6. Preamble for iterative operations. Figure 7. ML calculation for interval I and I’. with length equals to N/2. cept can predict the offsets correctly. Figure 9. Log-Likelihood function calculation. Figure 10. MSE of the timing offset estimation. Figure 11. 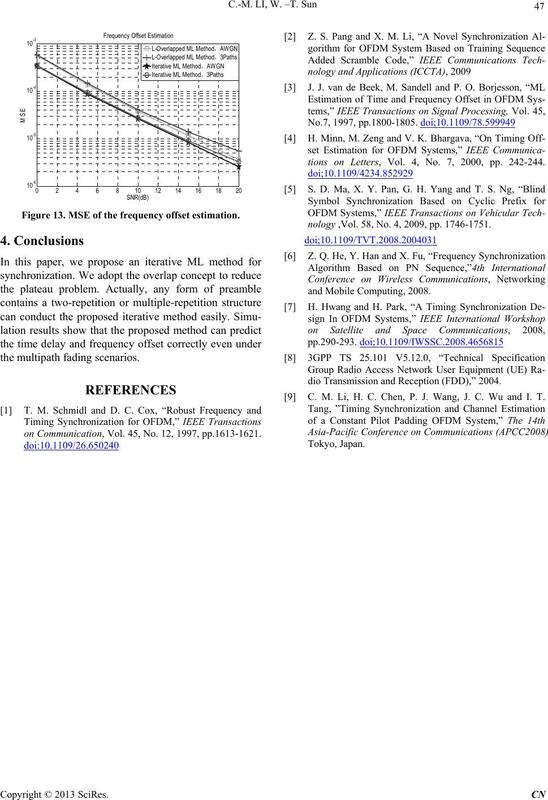 MSE of the frequency offset estimation. Figure 12. MSE of the time offset estimation. tions on Letters, Vol. 4, No. 7, 2000, pp. 242-244.
nology ,Vol. 58, No. 4, 2009, pp. 1746-1751. Figure 13. 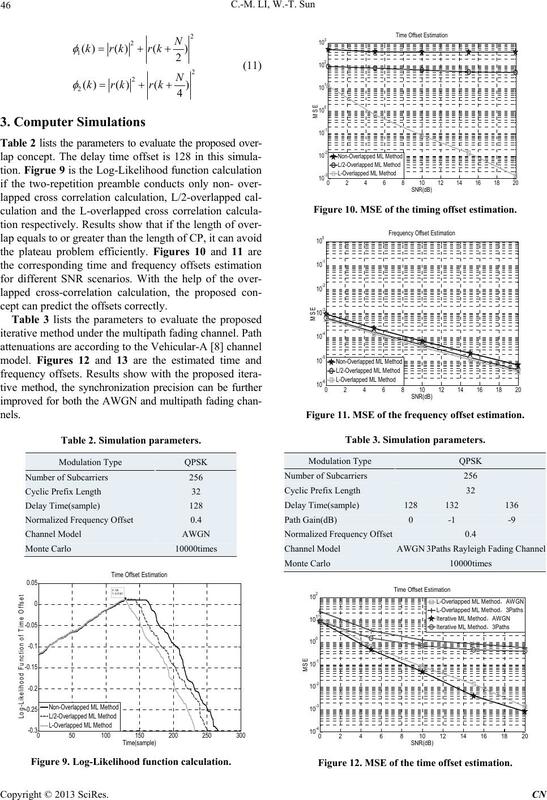 MSE of the frequency offset estimation. dio Transmission and Reception (FDD),” 2004. 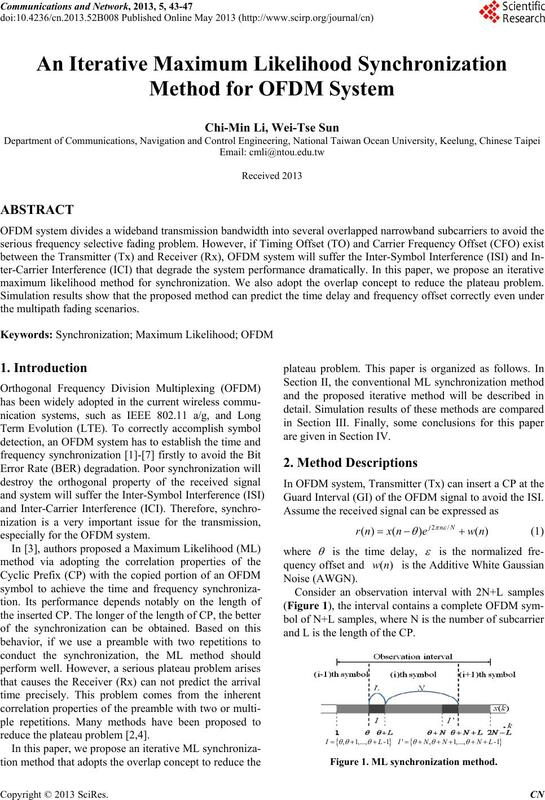 REFERENCES  C. M. Li, H. C. Chen, P. J. Wang, J. C. Wu and I. T.
on Communication, Vol. 45, No. 12, 1997, pp.1613-1621.